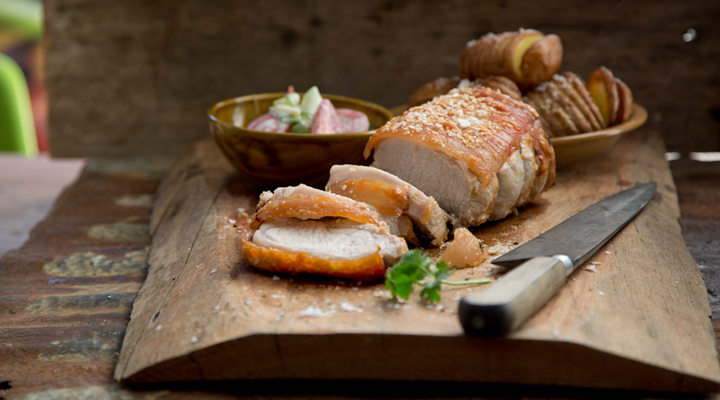 This pork loin goes wonderfully with hasselback potatoes and tomato and cucumber salad. 2. Cut the potatoes into thin slices without cutting all the way through them. The incisions should go about three-quarters of the way down. 3. Place the pork on a roasting tray with the prepared potatoes. Season with the herbs and a pinch of salt and pepper, then drizzle over the oil. Place the tray in the oven and cook for 45 to 50 minutes, until the pork and potatoes are cooked through, basting the potatoes occasionally. 4. Meanwhile, to make the dressing, whisk together the yogurt, garlic, lemon juice and honey in a small bowl. Set aside. 5. To make the cucumber and tomato salad, combine the tomatoes, cucumber and baby salad leaves in a bowl and dress with the olive oil. Toss and set aside. Just before serving, drizzle with the vinegar, season with salt and pepper and toss again. 6. When the pork is done, transfer it to a carving board and loosely cover with a tent of foil. Let it rest for 5 to 10 minutes before carving into slices. 7. Serve the pork with the hasselback potatoes and the tomato and cucumber salad. Drizzle the lemon dressing over the potatoes.